Steve and Carol Baucke have been in Southland for seventeen years, having shifted down from Te Pahu south of Hamilton. They have a 320 cow dairy herd on 300 acres near Woodlands, which is also the home of four broodmares and a small team of racehorses trained by Steve. “I milk in the morning and work the horses at lunch time, and do more farm work in the afternoon when Carol milks the cows,” says Steve. Both come from a racing background. Steve’s father Herbert trained horses for a decade between 1981 and 1991. His best was Haughty Milne (Haughty Romeo – Majestic Milne) which was bred in Southland by Grant Sim. He won three races for Baucke Senior. Carol’s parents Reg and Joyce Davey had horses too and raced Most Happy Milly, a Smooth Fella mare out of Armbro Mill. Armbro Mill was a half-sister to Gold Rand which won eleven races. Most Happy Milly won five races, all as a three year old. She was trained by Maurice McKendry. They also raced thoroughbreds and actually bred Arwon the winner of the 1978 Melbourne Cup. He was by Aritzo out of Fair Flash and was originally named Flash Guy. His Australian owners changed his name to Arwon which is Nowra spelt backward. One of the syndicate members lived in Nowra. Operative Asset was the first mare Steve and Carol bred from in 2006. She was by Armbro Operative out of Cash Asset which was also the dam of Auckland Cup winner Happy Asset ($451,353) and Mighty Khan – 6 New Zealand wins and twenty one American wins. Operative Asset was bred by Wayne Pierce and Dave Kennedy. Baucke trained her for seven starts with her best placing being a second at Wyndham in January 2011. Browngate Steady was from the famed Gordon Davidson breed. Operative Asset has been an excellent mare for the Baucke’s with five of her seven foals of racing age qualifying. The best of the mare’s progeny have been Belkmyster which won eleven races, Takitimu Express which has won four and the mare’s first foal by Christian Cullen, Citylight. Asignforbrownie and Citylight were the first horses Steve trained. He got his licence in 2010. On the track Citylight showed a fair amount of potential and Baucke decided to try his luck in Auckland sending her to Tony Herlihy. After winning five races and recording a good mile time of 1-56.5 Citylight was retired and is now part of the small broodmare band on the Baucke farm. As a broodmare she has left Bettor’s Delight colt Royal Gamble which was purchased by Lincoln Farms for $57,500 at the 2016 sales. He showed potential as a two year old racing in the Young Guns Series and running some creditable placings behind Mach Shard, Alta Maestro, Spankem and the like. He was exported to Australia in June 2017 and from only six starts he’s won three races and had two seconds. The mare’s only other foal a filly by A Rocknroll Dance, is two. Another member of the ‘Baucke Band’ is Citybabe (Falcon Seelster – Operative Asset). Her first foal by Gotta Go Cullen qualified for Ashburton trainer John Hay and has raced only once to date. Her 2015 colt, by Mach Three, was bought by local Gore trainer Allan McVicar for $23,000 at the 2017 Sale of the Stars. The mare’s latest foal, a colt by A Rocknroll Dance named Dancemyster was sold to Ben Waldron for $10,000 at this year’s Christchurch sale. Over those early years the Baucke’s also bred from In The Pocket mare Soleil D ’or, breeding three fillies: Acapulco Sunrise (Santanna Blue Chip) which was unraced, Delight My Soul (Bettor’s Delight) five wins and I’mallaboutthebase (Shadow Play). I’mallaboutthebase has strung a number of placings together including running second to Dizzy Miss Lizzy in last season’s Group Three Caduceus Club of Southland Fillies Mobile Pace. Soleil D ‘or was out of Corbie, a Vance Hanover daughter of Black Watch. 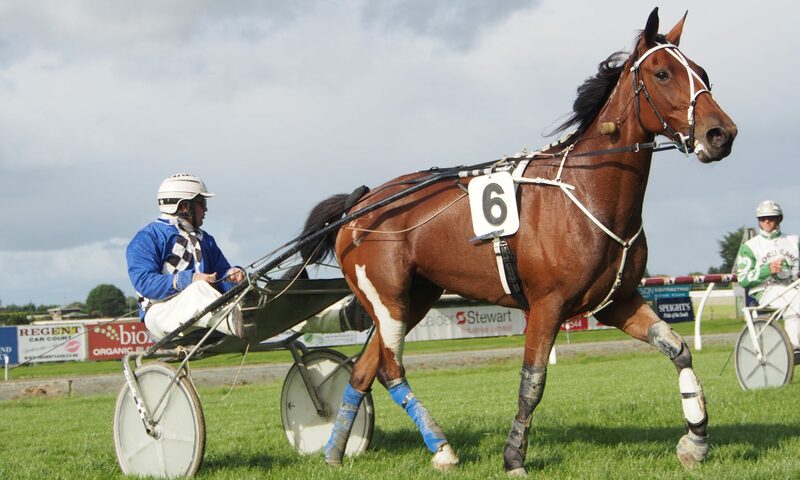 Another mare the Baucke’s are breeding from is Loyal Arden (Art Major – Tosca Hanover) which is a half-sister to New Zealand Cup winner Arden Rooney. Her first foal on the ground is by Bettor’s Delight and named Zed Bee. He was bred in partnership with Baucke’s neighbour David Sutherland. The colt was named after the branding on the R22 Helicopter, Sutherland flies. Zed Bee was Baucke’s other entrant at this year’s National Yearling Sale and was bought by RM and DG Gearny for $40,000. Loyal Arden has been served by Always B Miki. Steve and Carol have been taking yearlings to the Sales since 2009 and haven’t been deterred by some down years. Their yearling sale run started with Citylight. She was a buyback for $16,000. They reappeared again in 2013 with Acapulco Sunrise which was bought by Robbie Holmes for $10,000. In 2014 Takitumu Express ($25,000) and Delight My Soul ($15,000) were both buybacks while in 2015 Falcon Dazza sold for $3,000. In 2016 Royal Gamble was sold to Lincoln Farm for $57,500 and last year Macmyster sold for $12,000 to Mark Jones and Rumours to Allan McVicar for $23,000 so things are picking up. The racehorses are going well too with I’mallaboutthebase and Delight My Soul in good form. Ideal Asset, an American Ideal filly out of Operative Asset is also showing potential and qualified recently. Delight My Soul was sent to Auckland for Ray Green to train. Baucke felt there were more opportunities there for her with smaller fields and high stakes. He was right, as she’s won her first two starts in the North and banked over forty thousand dollars. She also has a 1-55 mile rating to add to her breeding page. The Bauckes enjoy running their dairy herd, a small group of race horses and broodmare’s with foals. And as to the future, Steve has a pretty simple breeding philosophy.